South American Israel supporters tour Samaria, meet with local politicians. Leader close to Brazilian leader says embassy will be moved. 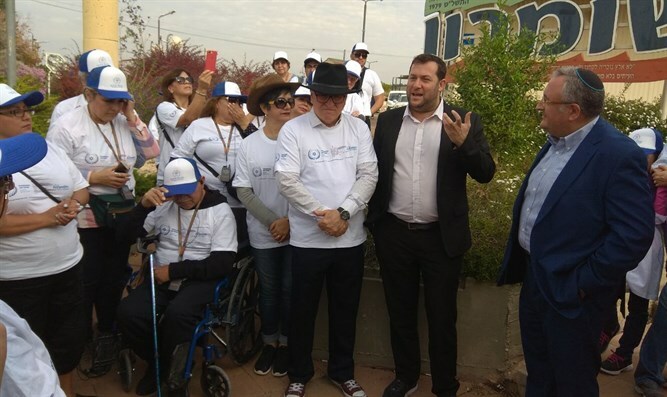 A delegation comprised of South American leaders and Christian supporters of Israel toured Samaria this past week in an attempt to learn more about the region. The dignitaries met with the Samaria Regional Council head Yossi Dagan, toured the Barkan Industrial Zone, and visited Rehelim's Tura winery. A close confidant to incoming Brazilian President Jair Bolsonaro predicted that he would end up moving his nation's embassy to Jerusalem despite the Arab pressure not to. "We have never had politicians with such faith in their hearts and what is happening now in Brazil with the choice of the president of Brazil," said Carlos Kiroa, a close friend of Bolsonaro. "In May, we met with Bolsonaro, who was then a candidate for the presidency of Brazil, and we talked about the importance of supporting Israel," said Dr. Kiroa. "Bolsonaro announced that his commitment to Israel will be unequivocal and, of course, his support for Judea and Samaria." "We are pushing hard to continue the trend throughout Latin America. It was May, and now as an elected president, Boulsonaro said that his support for Israel would be eternal and the transfer of the embassy from Tel Aviv to Jerusalem was the first thing he would do." Yossi Eldar, who is the president and founder of the Parliament for Israel, said that "The Parliament for Israel was founded in order to connect Latin American countries and parliaments to the Land of Israel, the land of the Bible by bringing leaders from Latin America, establishing lobbies in various parliaments, Jerusalem, influence on UN votes, prayer marches for the State of Israel, and more." "We are working to promote the change that we all see: Latin America is becoming a better friend of Israel and a better friend of the biblical West Bank."